My car just told me to stop texting and watch the road! Does that interaction sound unlikely? It may seem like the realm of science fiction, but AI and 3D face recognition will take an increasingly important role in how we interact with our vehicles. I remember in the 1980s there was a very successful TV show called Knight Rider, based on the adventures of a high-tech modern crime fighter assisted by KITT, an advanced, artificially intelligent, self-aware and nearly indestructible car. The continuing miniaturization of 3D cameras and increasingly powerful AI software are expanding the applicability of artificial intelligence and machine learning and pushing them into many traditionally unlikely settings. The automotive industry is one of the most exciting verticals where AI and 3D face recognition have the potential to transform a wide range of use cases. Cars can now detect not only who is approaching or inside, but more importantly, what they are doing in the car. The implications for improved safety are tremendous. When someone is driving, algorithms designed for awareness detection will be constantly monitoring the vehicle as well as the human at the wheel. Is the driver paying attention to the road and the traffic and the directions? Is he dozing off or distracted by a text? Did he drop his cheeseburger or is he adjusting the radio? Are other vehicles too close, signaling to change lanes or slowing down unexpectedly? 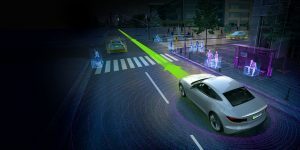 Thanks to 3D cameras and AI software delivering awareness detection that uses face recognition, along with AI-assisted sensors and software, the car will actually be constantly monitoring both itself and the driver’s behavior. Based on continuous real-time analysis and 3D cameras that work in any lighting conditions, the car will determine if it should intervene — perhaps by talking, sounding an alarm or using some other predetermined alerting technique, up to and including bringing the car to a complete stop. More and more automotive manufacturers are taking advantage of breakthroughs in AI and machine learning. There were many examples of AI in cars at this year’s CES show in Las Vegas in January — some fantastical and unlikely, but others with real applicability and actual immediate benefit. For example, Nvidia announced two new software platforms for self-driving cars that allow manufacturers to create artificially intelligent co-pilots that use sensors both inside and outside of the car to provide driver assistance. Broader applications are also on the horizon. As cars become part of the internet of things and start communicating with various other devices and each other, there is talk of the evolving ultra-connected car. You might one day be speaking to your vehicle and asking it to turn on the wall oven at home so the pizza is piping hot when you walk in the door. And certainly, in the longer term, we’ll see increased adoption of autonomous transportation and mobility models, all driven by AI and machine learning applications. I look forward to having a “robotaxi” arrive at my front door and take me to the store or the movies or the dentist. No complaints from me about being able to read or work instead of gripping the wheel and watching the road. AI-powered chips and sensors, along with 3D face recognition awareness detection, are poised to transform how we interact with our vehicles. Personally, I am looking forward to a test drive of a new All-Wheel Drive Watson.